Last year, Live Life Give Life, a charity that Art Transplant supports and I am a trustee of, ran ‘the Day of the Living’ – a new campaign to raise awareness of organ donation, remembering those who donated, and celebrating those who are only living because of donations. Taking inspiration from the colourful Mexican festival The Day of the Dead, in which ancestors are remembered with a vibrant and colourful festival; The Day of the Living raises awareness about the importance of organ donation with in the same vein. As part of that campaign, we were able to participate in Celebrabis Vitae, Skull-art exhibition at Box studios in Shoreditch, London, which features skull-based/themed artwork. This was to to go hand-in-hand with sugar skull face painting (as is done in The Day of the Dead festival). There were some excellent pieces from many artists and it was a priviledge to be able to have work surrounded by such talent. My contribution was a mixed media piece using gouache on paper, stainless steel pins and canvas. 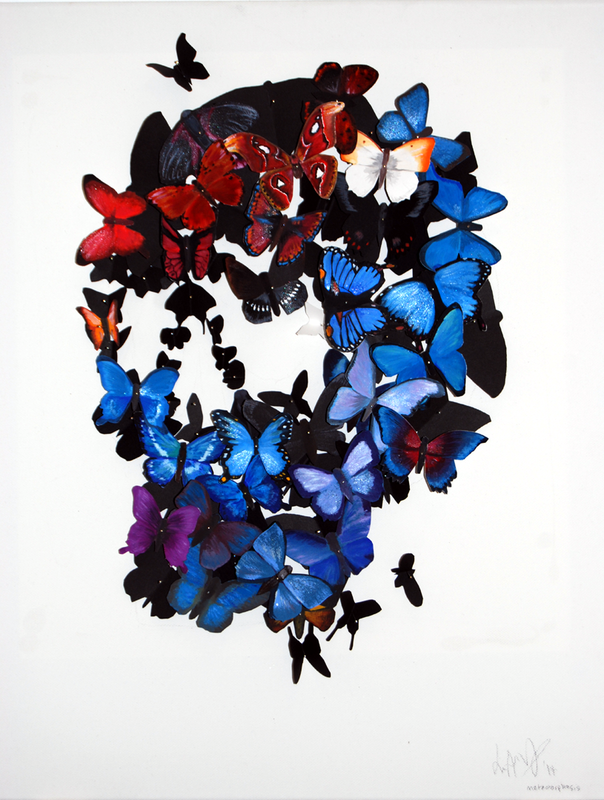 I created hand-cut and painted butterflies and moths and pinned them to a mount, as collectors would had done with real specimens, into the shape of a skull. The title of the piece was metamorphosis, as in my mind this embodied and described the transformation of life and death when donating your organs.